Xwísten is part of the St’át’imc Nation, whose territories extend from Pavilion in the northeast to Skookumchuck and Port Douglas in the south. The traditional territory of Xwísten includes the entire watersheds of the Yalakom and Bridge Rivers between Mission Ridge on one side and the Blackhills Creek and along Camelsfoot Range on the other. See a map of our territory. Since time immemorial we have used the west bank of the Fraser from West Pavilion to Lillooet to fish for salmon. Especially important to our people are the fishing rocks on the Fraser River at the mouth of the Bridge River and the rapids upstream. Salmon has always been a major source of food, but fishing also is an important social and cultural activity. Management of fishing in this area has long been the traditional right and responsibility of the Xwísten people. The Bridge River Salmon run was one of the world’s largest. In the 1950’s BC Built the Terzaghi dam 45 km upriver and diverted most of the water to Seton Lake for hydro-electric power generation. 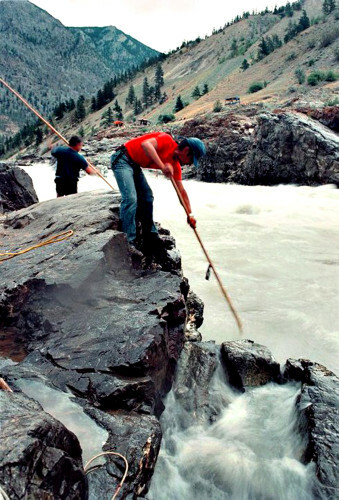 An attempt was made to relocate the salmon run to Seton Lake, leaving the Fraser at Cayoose Creek, 10 km south of the Bridge River fishing rocks. Some salmon have returned to the river, but it the run has not achieved its former abundance. The Bridge River- Yalakom area has also been known as a rich hunting ground. Deer, mountain goat, and mountain sheep are still hunted by members and others each fall. Xwísten members have historically lived primarily off of agriculture, fishing and hunting. In 1858 gold was discovered in the area, and Xwísten members began to earn income by providing agricultural products including beans, wheat, oats, and potatoes to the gold miners that came through Lillooet. In 1862 our community was devastated by the introduction of smallpox, but we survived and carried on. We continued to provide agricultural products to the market until mid-twentieth century when the nature of agricultural markets changed and our efforts became unfeasible. By the 1960s, most farms in the Bridge River area were abandoned and irrigation systems fell into disrepair. Since then, we have continued to hunt and fish and have witnessed several swings in the resource economy in our area. We are becoming increasingly resilient as we diversify our economy and see increasing numbers of our students graduating from high school and post-secondary. We are proud of our history and culture and continue to make it a part of our every day lives.